MMandy Aubry is a director of Global Business Development and Client Relations at Songtrust. Once named a “Top Music Startup” by Billboard, Songtrust now powers the publishing administration technology for over 150,000 songwriters and 20,000 music publishers worldwide, as well as more than 1 million copyrights. One out of every five new songwriters in the US use the Songtrust platform today, and the number seems to be growing steadily. As you will hear, Mandy has a fascinating music industry background, having worked at Mercury Records, Roadrunner Records, and Fintage House prior to joining Songtrust’s team in their Amsterdam office. 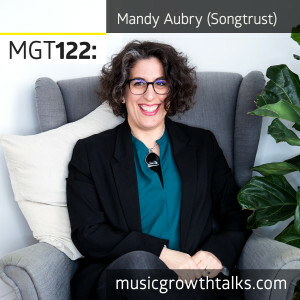 On this Music Growth Talks episode, Mandy talked about Songtrust’s rich background and what makes the platform unique, explained how to collect publishing royalties from streaming, clarified a difference between publishing administration and a publishing deal (and why the latter may in fact be bad for you), and shared her thoughts on if you should sign up with your distributor’s publishing services. Listen to the episode in full to learn how to never ever leave money that’s due to you as a songwriter on the table. BONUS! As you will hear at the end of the episode, Mandy offered a discount on Songtrust’s registration fee to the Music Growth Talks listeners. The first 100 of you who sign up with Songtrust will receive a 10% discount on the usual $100 (USD) per songwriter/per 50 titles if you use the discount code DOTTEDMUSIC.